What is a personal SWOT Analysis? First things first — ‘SWOT’’ is an acronym for Strengths, Weaknesses, Opportunities, and Threats. 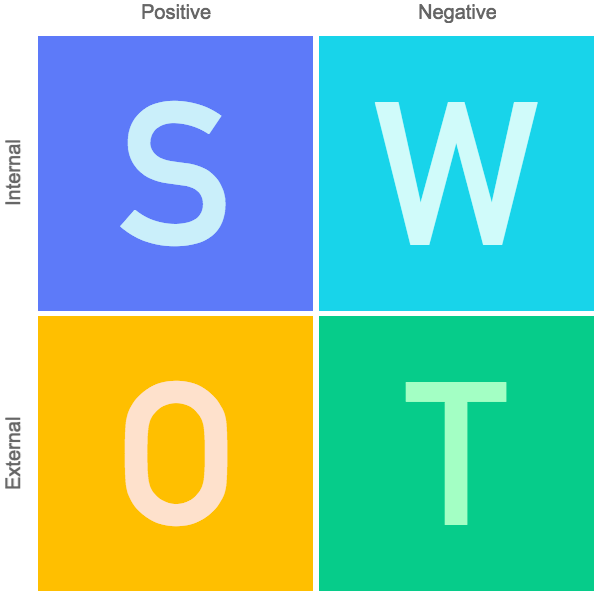 The SWOT Analysis began its life in the ‘70s as a planning tool for analyzing a professional project or business venture. Unchanged in its format, it’s still used today to help businesses focus their thoughts, analyze their progress, and strategically shape their decision-making. 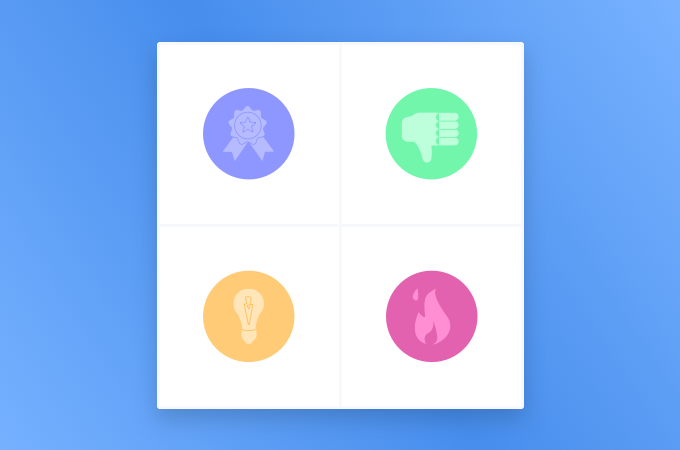 But it’s more than just a business tool: a SWOT Analysis is a useful development exercise that can help you identify and evaluate your own personal goals. Thinking of a career change? Preparing for a job interview? Listing everything down in a SWOT diagram will clarify your thoughts and help shape your application or resume. It will also help you identify the unique strengths that distinguish you from your competitors. Plus, it has the added bonus of being really easy to do, without the need for prior training. It’s simply four squares — two up, two down, labeled clearly. Just like the diagram below. You can whip it up by hand, or, if you want a more organized, professional look, use a diagramming tool (we offer multiple templates for it in Cacoo). Be aware that when creating a SWOT diagram, personal biases will shape your answers. Even if you’re asking a colleague about your strengths and weaknesses, they may have their own biases both for and against you. There’s also no obligation to verify any statements or claims, meaning you could theoretically claim anything. Backing up statements with examples, or involving one or two external opinions, is a great way to help minimize this issue and create a rock-solid analysis. Are you one of those people who hate talking about themselves? If not, then lucky you — you should find this a total breeze. But if you are, don’t fret; you’re not alone. There’s nothing scarier than a blank page, especially when you have the daunting task of talking about yourself. Properly knowing your own strengths and weaknesses is no easy task, so don’t think you have to do this by yourself. Find a colleague you trust, book a quiet room and ask them their opinion. Better still, if there are a couple of people you trust, get a second person’s opinion for a truly full picture. Keep in mind: not everyone has the gift of the gab; some express themselves better through writing, so it’s a good idea to offer people the option to write down their thoughts via email, or over a messaging app. This gives your colleagues the opportunity to express themselves in a format they’re most comfortable with, which in turn gives you the added bonus of having more thoughtful, complete answers. Win! Let’s begin your personal SWOT Analysis. First, separate your diagram into your four sections. Then, using all the information you’ve gathered, start writing out your strengths, weaknesses, opportunities, and threats. This is where you get to really show off. Remember to make it as personal as possible. What skillset can you bring to the company or role? Even better, what makes you unique. For example, if you’re a designer, having a degree in art and design probably won’t set you apart, but having an award is pretty special. Think of everything you excel at, including specialist skills and knowledge that benefits the organization. List your professional skills and qualifications, including certifications. Recall your key achievements, including successful projects and campaigns. What other personal skills do you have? For example, are you calm under pressure? Are you a great leader? A patient listener? If you have examples to back these claims up, then all the better. And remember, these examples don’t necessarily need to be actions performed in the workplace. If you did something awesome like rescue a kitten from a tree, then don’t keep it to yourself! Do you have great industry contacts or leads? Write that down too. At first glance, this is the least fun part. After all, no one really likes to think about what they’re not good at, right? But it doesn’t have to be self-esteem-crushing exercise. It actually has the potential to be the most beneficial section of a personal SWOT Analysis, not to mention the most motivating. The trick is to be as completely honest as possible. This doesn’t mean being unnecessarily hard on yourself; it just means being truthful. The goal here is self-improvement. For every weakness, think about a way in which you could overcome it. List all your professional bad habits. For example, do you struggle with group participation? Do you need to brush up on your public speaking? Or could your organization skills do with a little TLC? Remember, no one is good at everything, so don’t feel bad about listing three, four, five or ten areas for improvement. It just shows you have a good degree of self-awareness. Own it! Think about your professional qualifications, and where you want to go. Are there any skills you don’t have that if gained, would really strengthen your career? Now it’s time to think about external influences. Your list of opportunities could be personal or within the wider industry. Look at how the industry is developing. Are there influential people you think are worth keeping an eye on? Or perhaps there’s a new technology or service you think could benefit you or the business. Are there opportunities within the business that aren’t currently being exploited? For example, a more efficient way of running a project? Perhaps there’s a new job vacancy you think you’d be perfect for. Are there any training courses you think would make you stronger at your job? Refer back to your weaknesses section to inform your answers here. For this final part of the SWOT Analysis, you’ll need to identify any external obstacles that are standing between you and your vision of success. Are any of your peers holding you back? Is there someone on the team who is making your job harder? How could you approach this problem constructively? Compare yourself to your peers. Are you being overshadowed by a more vocal or ambitious colleague? What can you do about it? Are there new processes or technologies pushing the industry forward, and your lack of training means you’re trailing behind? Think about how you can fix this. A personal SWOT Analysis is a great way to organize, prioritize, and plan your personal development. It’s not without its limitations, and its simplistic format means further in-depth analysis may be required. But as a quick and easy no-training required development tool, it’s extremely helpful and definitely worth your time. What do you think are the pros and cons of creating a personal SWOT Analysis? Share your thoughts with us on Twitter! Georgina Guthrie Georgina is a displaced Brit currently working in France as a freelance copywriter. Before moving to sunnier climates, she worked as a B2B agency writer in Bristol, England, which is also where she was born. In her spare time, she enjoys old films and cooking (badly). To help our long-time users adjust to the new Cacoo dashboard, we're diving deeper into our updates. Learn about Folders, Templates and the App Switcher. What’s new with the #newCacoo dashboard? What’s new with the #newCacoo dashboard?